Baytree Cottage01328 878304work01328 830786fax Self-cateringExtremely well equipped flint cottage set in the heart of the lovely village of Binham and only 3 miles from the coast. Extremely well equipped flint cottage set in the heart of the lovely village of Binham and only 3 miles from the coast. Consisting of 1 double, 2 single bedrooms, bath/shower, lounge/dining area, kitchen. The cottage has full central heating, the garden is fully enclosed and it has private parking. 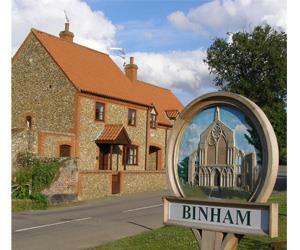 The village of Binham is approximately four miles off the A148 at Thursford. Watch for the brown and white signs to the 'Thursford Collection' and follow the road signs through Hindringham to Binham. Once in the village take second turning right. Look out for the village sign on the junction.